The breed was developed in England in the 1600's, though it is believed that it has its roots in France in 1500. 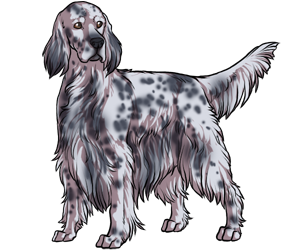 It was originally bred from the French and Spanish Pointer, getting it the name Setting Spaniel. The name "Setting Spaniel" comes from the pose it does when it is finding prey. It is commonly called Laverack Setter. The breed can hunt, track and retrieve.